In this exclusive excerpt from his new book, Feeding the Monster, Seth Mnookin explores the fascinating, curious, and combative relationship between Red Sox CEO Larry Lucchino and the young man he hired to build a championship team, general manager Theo Epstein. WHEN THEO EPSTEIN BECAME BASEBALL'S youngest general manager in December 2002, he signed a contract that ran through October 31, 2005. Those years appeared, to most outside observers, to be blessed ones: the Red Sox made the playoffs three seasons in a row for the first time in their history, and, of course, they won the World Series. But unbeknownst to almost everyone within the organization, the relationship between Epstein and CEO Larry Lucchino, the man who'd brought Epstein to the Red Sox from the San Diego Padres, had been souring for more than half the time that Epstein had been in the job. By the end of the 2005 season, Epstein had also become frustrated with the aggressive PR approach of the team and the suffocating nature of life in Boston. "For me, personally, if this organizational approach keeps up, I think I have one or two more years here, and that's it," Epstein said. "I don't care for it, and it makes it impossible for me to have a life that's tolerable, by my standards. When we suffer the inevitable off-season or downturn in performance, however brief, things could get really ugly around here. If I'm going to commit to staying, I need to know we're all in this together. I need to know the first time I make a controversial trade or something's not going right, I'm not going to be undercut and thrown out there as chum." On Saturday, October 8, less than 24 hours after the Red Sox had been swept out of the playoffs by the Chicago White Sox, principal owner John Henry came down to Epstein's office in the basement of Fenway Park. For months, Henry had been worried about Epstein. He seemed, Henry thought, unhappy and exhausted. "I could see in his expression that he wasn't having a good time," Henry says. "He stopped sitting in the stands [during games]. I really began to be concerned." In the time since Epstein had been named the team's general manager, Epstein and Henry had grown close. Epstein would frequently call Henry in advance of a big series simply to shoot the breeze about this or that pitcher or what the team's scouting reports indicated. The two shared a passion for searching out new ways to understand the game, and their conversations sounded as much like two friends talking as they did an employee speaking to his company's owner. But they had never, out of respect for the hierarchy of the organization, discussed Epstein's disintegrating relationship with Larry Lucchino. That day, Epstein at last told Henry of his months of anxiety and frustration. He explained how he'd felt left out to dry after the trade of franchise icon Nomar Garciaparra, how he felt increasingly isolated from much of the organization, how he felt that the team's obsession with generating more and more press coverage actually made it difficult to focus on what he thought should be the team's primary goal: winning baseball games. Lucchino had also opened up to Henry, about how he felt the criticism he often received from the press originated, at least in part, from within the organization. 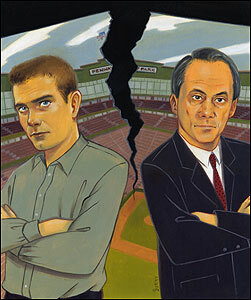 During the 2005 season, Lucchino had become more agitated in the face of ESPN's Peter Gammons' barbs. "A lot of the whole PR tension began over the A-Rod situation," Lucchino says, referring to the team's aborted effort to land Alex Rodriguez following the 2003 season. "I look back to that as a time where there was a lot of pillorying going on, and I really started to be the preferred target." Only now did Henry begin to appreciate the severity of the rift between Epstein and Lucchino. "With Larry, there was the A-Rod stuff and the Gammons stuff, so you had this situation as far back as before we won the World Series where both [Epstein and Lucchino] felt the other was throwing him under a bus with the media, that they were out to get the other," Henry says. "Until then, I never realized it. I didn't realize it was a big deal." Henry told Epstein he had to speak with Lucchino. "You need to lay it on the line and have a difficult conversation," Henry told Epstein. "You guys need to trust each other. You have to have each other's back. [Red Sox chairman] Tom [Wermer] and Larry and I, we have each other's backs. We've always felt that way, from day one." Henry told Lucchino the same thing. And so, at Henry's urging, Epstein and Lucchino met on Tuesday, October 11. But Henry had underestimated the calcified rancor and bitterness that existed between the two men. Instead of helping to clear the air, their recitation of grievances only further poisoned the atmosphere. "It didn't work," Henry says. "It blew things up. It drove them further apart as opposed to bringing them together." With just less than three weeks left before Epstein's contract expired, it seemed less likely than ever that the boy-hero GM would stay with the Red Sox. AS THE PRESS COVERAGE OF Epstein's unresolved contract situation intensified during the final weeks of October, Epstein's salary demands - at one point he asked for $2.5 million per year - were leaked to the media. Even as Epstein considered the leaks further evidence he couldn't trust certain people in the organization, Henry - who'd first learned of Epstein's salary request through a newspaper report - found himself frustrated with his general manager. Epstein was asking to be the highest-paid GM in the game, double what most other general managers were making. Henry, who'd talked often with Epstein about their determination to accurately read the market, was confused. "How can that be the market?" Henry asked. One of the ways Henry deals with his displeasure is by simply ignoring a person. "Theo and I had been very close," says Henry. "But when money became the issue, we basically stopped communicating. At that point, I was mainly on Larry's side." Despite Epstein and Lucchino's strained relationship and Henry's newfound anger, Epstein and the Red Sox began to inch slowly toward an agreement. By late October, the main stumbling block seemed to be Epstein's bitterness over the continual leaks about the negotiations. Early in the week of October 24, Epstein, while turning down a three-year offer worth $1.2 million annually, gave Henry, Werner, and Lucchino what he considered his bottom line: He wouldn't come back for less than $1.5 million a year. By Thursday, October 27, Epstein and the team had come to terms for precisely that amount. "We pretty much had a deal," says Henry. "All of the [outstanding] issues had been laid to rest," says Henry, "except these ongoing leak issues." But instead of signing the deal before the end of the week, Lucchino recommended they wait until Monday, October 31, the last day Epstein was still under contract. Henry was confused. "I said, `Why are you pushing it back to Monday?' " Henry says. "And Larry said, `To give him three extra days to think about it. It's a big decision.' I wasn't in favor of waiting, but I said fine." Epstein did think about it, and by the time he woke up on the morning of Sunday, October 30, he was at peace with his decision. He would remain with the Boston Red Sox. He'd reconciled himself to a lack of privacy for as long as he stayed in the job. He'd promised Henry he would no longer isolate himself in the baseball operations' basement fortress, and after more than a year of reenting Lucchino, he realized he shared responsibility for their damaged relationship. Then he got a phone call alerting him to an article in that day's Boston Globe. On the front page of the paper's sports section was a Dan Shaughnessy column entitled, "Let's Iron Out Some of This Dirty Laundry." When Epstein began reading, he felt his stomach drop. After weeks during which he'd talked with Henry, Werner, and Lucchino about his unease about the organization, here was confirmation of his worst fears. In his column, Shaughnessy, who'd known Lucchino since the 1980s, when both men worked in Baltimore, chided Epstein for not properly respecting his superiors. After all, Shaughnessy wrote, it was Lucchino who'd "discovered" Epstein and "held his hand" during his first years in baseball. Now, Shaughnessy wrote, Epstein was exhibiting an "alarming . . . need to distance himself from those who helped him rise to his position of power." Epstein, according to Shaughnessy, didn't even know all that much about baseball. "It's a mistake to say [Epstein] knows more about baseball than Lucchino or anyone else in the Red Sox baseball operation," he wrote. After reading Shaughnessy's column, Epstein sat down and wrote Henry an e-mail. The next day, Epstein wrote, he would resign as general manager of the Boston Red Sox. "I have a huge pit in my stomach," Epstein wrote. "But it's nowhere near as big a pit as I'd have if I'd already signed a contract." Three days later, on November 2, Epstein and Henry were forced to give a press conference before dozens of members of the local and national media. Even as the two men were giving their torturous explanations for Epstein's departure, Henry had begun a campaign to secure his return. Henry began by asking Epstein outright to come back. When Epstein said no, Henry tried a different approach. How, Henry asked Epstein, would he recommend running the team's baseball operations department in his absence? As much as he didn't want to discuss his own future with the team, Epstein couldn't help but get excited when discussing the Red Sox and how they could best achieve their goals. The team, Epstein told Henry, had to be less concerned with the next day's headlines. "The reason the Red Sox never win the World Series is because they're always concerned with what the newspapers are saying," he said. "There's a sort of extreme short-term thinking, always trying to build a super-team that wins the World Series that year. They're way too concerned with the Yankees, the fans, and the media. And now that we've won the World Series, it's a great opportunity to do what's right: ignore all that and building something that will last, something for the longhaul." Henry agreed wholeheartedly, and over several weeks, the two men spoke in more detail and with more passion than they had in months. "The experience of us doing that, of having these conversations, definitely brought us closer together," says Henry. As they kept talking, "it became clear that he and I were completely on the same page with respect to our long-term vision for the organization," says Epstein. After a month of conversations, Epstein's stance had softened. If Henry does become more involved, Epstein remembers thinking, "and we pledge mutual commitment for a certain ideal, then does it go from being a bad situation that was ripe for leaving to possibly one of the best situations I could imagine? Yes, it does." By the time of baseball's winter meetings in early December, Epstein, Henry, and Werner had agreed Epstein would return to the team. "I guess some people might take this as a slap at Larry," says Henry, "but the one thing we agreed to was that I would be more involved. I hadn't been involved." LOOKING BACK, the 2005 season was, as Henry says, a "hangover year." "You've been focusing on something, you accomplish your goal, and you say, `Now what?' " Henry says. "Human beings really thrive when they have a cause or a goal regarding something larger than themselves." Employees on every level of the team were exhausted from the energy and effort that went into winning and celebrating after the Sox's historic World Series. Throughout all this, Lucchino, exhibiting the trademark relentlessness that has made him one of the best CEOs in all of professional sports, kept pushing forward. Now, after the tumult of last year's off-season, even Lucchino seems to have a new appreciation that more is not always better. "I realized [after the events of the 2005 off-season] that we need to slow down," he says. Before each new season, Lucchino usually comes up with new ways for the Red Sox to promote their brand or new business ventures the organization can embark on. This year, he did the opposite, drawing up an "86 list," named for the shorthand restaurants use when a dish is no longer available. "We're going to 86 the players' picnic in Fenway in September," says Lucchino. "We're going to 86 excess [Red Sox] Foundation events. . . . They're small things, but they all get to the big picture, which is that we're first and foremost a baseball team, and we've got to sort of keep our eyes on the prize." This year, behind the scenes, Epstein and Lucchino found their working relationship was better than it had been at any point since 2003. Not long after Epstein's return, Lucchino suggested that, in order to cut down on confusion, Epstein should be the person from whom the media got their information about the team's baseball operations, and the general manager began parceling out news as he saw fit instead of eagerly feeding the baseball press's always-voracious appetite. Epstein made a commitment to integrate his staff more with the rest of the organization, and both men realized they had allowed several years worth of resentments and unspoken recriminations to fester unnecessarily. "You know how it is in relationships," Henry said shortly after Epstein had agreed to return to the team. "You refuse to say something to your wife or girlfriend, and it builds up until you finally talk about it. So we had some things build up, and now that we've gotten them out, it's much better." Excerpted from Feeding the Monster: How Money, Smarts, and Nerve Took a Team to the Top, to be published Tuesday by Simon & Schuster. Copyright © 2006 by Seth Mnookin. Send e-mails to magazine@globe.com. Click the play button below to hear author Seth Mnookin read an excerpt from his new book about the Red Sox, called "Feeding the Monster"